Freeware fans should be happy to learn that Kingsoft has released a bundle of applications which tune and optimize Windows. The Kingsoft PC Doctor application is actually not just one program, but a bundle of utilities meant to help boost your system performance and optimize your computer. This program includes tools to optimize your Internet browser, perform Windows optimization, protect your data and clean your registry. 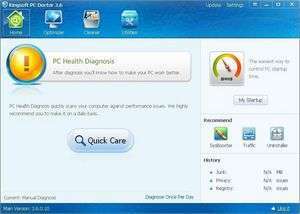 PC Doctor is able to perform a multitude of tasks to make your Windows PC run smoother and fix lingering issues which happen after you've had your computer for a while. Version 3.7.0.47 is a freeware program which does not have restrictions and it's free so it doesn't cost anything. For security reasons, you should also check out the Kingsoft PC Doctor download at LO4D.com which includes virus and malware tests. Additional screenshots of this application download may be available, too. PC Doctor has a presence on social networks.